Earlier today, Nokia announced Lumia 920, which comes with PureView, the same technology which received a decent response for 41 MP Nokia 808 device. During its press event, Nokia gave a look at the new PureView’s main feature: optical image stabilization (OIS). The idea behind this new feature is that it stabilizes the video you’re recording, giving you a more professional look instead of the amateur shaky-cam effect. To demonstrate this technology, Nokia played an impressive ad which show cases a side by side comparison of the video shot without OIS and with OIS. Obviously, the video shot without OIS doesn’t look very good, whereas the video shot with OIS activated looks excellent. Strangely, Nokia faked this PureView ad! Its been revealed that the ad was not shot using the Lumia 920 and Nokia admitted in an official blog post. Here is how Nokia faked its ad. Also, if you go to 0:48 of the video, you can clearly see the DSLR shadow which is hooked up to the swing. 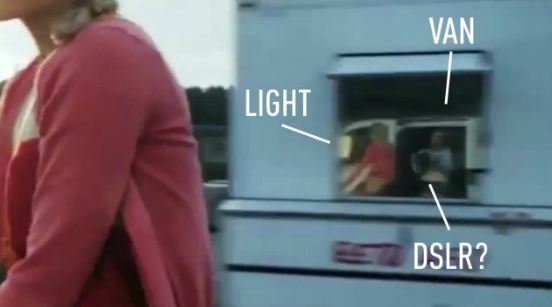 As you can see in the video and photo above, there’s a curious reflection in the window of the trailer in the background. It’s not a young man riding his bicycle alongside the cheerful model, but instead a big white van with a lighting rig and a cameraman standing in the doorway — with what appears to be a large camera rig. Whatever he’s holding, we can reasonably agree it’s not a Lumia 920. The Lumia 920 pictures in this post were taken using prototype hardware and software, and then reduced dramatically in size. In addition, the OIS video, above, was not shot using the Lumia 920. The point is average Jo would think that it was shot on the Lumia. Whatever it may be, and despite the mistake happened, Nokia’s PureView technology may does what the company is claiming so far, may be up to some extent if not all shown in the deceptive demonstrations. What’s your take on this whole thing? Bonus: Animated gif of the busted clip! Update 2: Nokia has come around and apologized formally for the above hand trick saying it should have put a disclaimer in the video. In addition, they released a new video showing the magic of PureView with an actual Lumia 920 device. The difference is clear. Happy now? It’s an ad what did you expect? Panasonic shot some Lumix GH1 advertisements on Canon 5d. The advertising company shoots the ad not the phone company. Too funny, the ad agency were undoubtedly paid handsomely, yet still managed to screw up the fakery. Proof, if it was needed, that they are self regarding w**kers.